Even though the last day of school was weeks ago it took me a bit to settle into summer. School may have stopped, but life didn’t. I was finishing up a training program and Sky was in full on dance practice getting ready for a public performance and a recital. Spray Park fun with friends! And, it took me a week or two to get back into the full time stay at home mom gig. Even though I work outside the home (during the school year) I still feel like a SAHM, so I was surprised to find myself a little adrift at how to settle back into life with Sky, just the two of us all day, every day. I still feel a little afloat, but we are having fun and managing to get everything done that needs doing. Fairy Fest…Sky with some of the fairy’s from Charisma School of Dance. When it’s sunny we are taking our workouts and summer school work outside, hitting the park and spray parks as often as we can, scheduling play dates, and getting in a ton of cuddle time. She still thrives on cuddle time with lot’s of silly conversation and tickles mixed in. One thing I had no trouble getting back into….long slow lazy starts to the morning. It does take us a very long time to get up and going and out the door. We just enjoy taking our time in the morning, and I’m ok with that. Soon enough it will be back to work/school and back to rushing out the door, so for now we are slowing things down and enjoying the sun, and doing what we want. Friend time…making sure she gets lot’s of that this summer! It’s almost time for 4th of July and we have a busy week of vineyard work, visiting with family, and a family reunion that has been in the works since December last year! So excited for all the festivities and family time this week! Happy Summer, and Happy 4th! We had so much fun at Water Follies in E WA, and got a summer sun fix…talking triple digit temps! That’s something we just don’t get in W WA…shoot we are barley getting summer sun at all right now. (It’s cool and rain on and off right now). Boo. Red solo cup photo bomb. We camp out on the river Friday, which is practice runs, heat qualifications etc, and the practice air show. We get to see the air show, watch the boats, eat and drink all day long….without the crowds, and without paying to get in! Pretty sweet, and it frees up the rest of the weekend to have fun with friends, let kiddos run around, eat yummy food, and wine taste…I mean what else would we do in E WA wine country? Go, go Hydro Boat…staying cool in the river on a HOT day! Playing Dress Up with Aunt Michelle’s summer stuff! So stylish! 14 Hands Winery…one of our faves! Always a fun weekend full of friends and family! Now to enjoy August in the PNW and get ready for school to start! 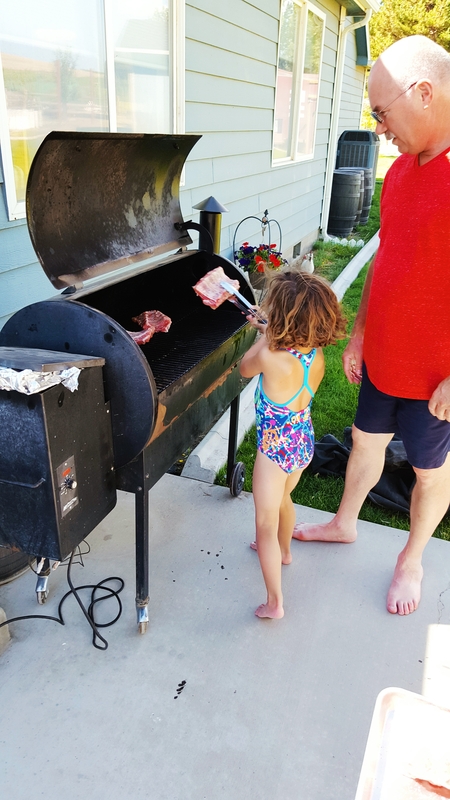 I mean does anything say summer more than grilling ribs in a swimsuit? 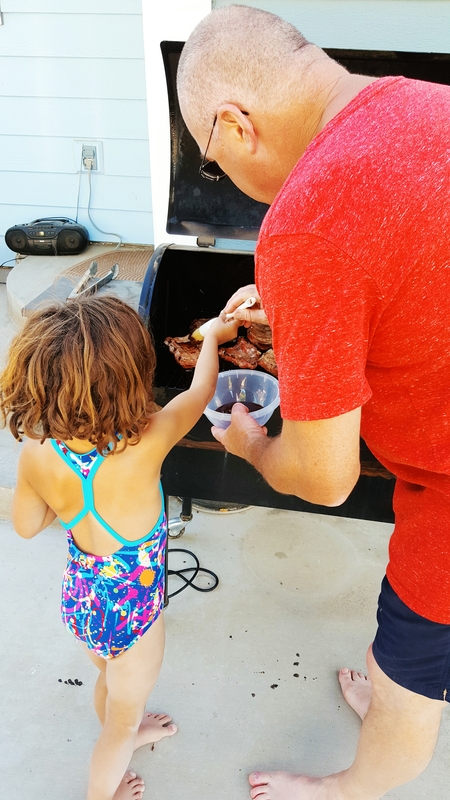 Between helping daddy grill steaks and helping Uncle Paul with ribs she’s going to be a grill master! Sadly, in W WA we are waiting for summer to kick in. It’s been cool, rainy, and gray since the 4th. Boo! Oh well, I guess that’s what socks with sandals, hoodies, and outdoor heaters are for. A glimpse at life with Sky as of late. It’s been a fun summer so far and we are only two weeks in! Playing boats, with Grandma, at Bass Pro Shop…we can kill a good hour doing this! She’s so excited for her “big girl school”! We find ourselves at the playground almost every day! Putting her to work cleaning out gutters. Just kidding…she likes climbing, and being Sky, up in the sky! It’s so easy to be busy during the summer. I know I schedule in a lot of “down” time. Time with no plans, no play date, no leaving the house. Sky is fueled by cuddles, at the end of busy days I always hear, “But Mommy we didn’t even have cuddle time today”, and them we cuddle and all is right with the world. She needs down time, I need down time, we all need down time. It’s easy to forget that life doesn’t have to be lived at full speed all the time. It’s ok to live life in the school zone, taking in the sights, living slow, enjoying peace and quiet. Here’s to a summer full of fun and cuddles!